Dubai Airports has introduced the next generation of interactive virtual assistants which are able to respond to passengers’ queries for information in English and Arabic, providing passengers with more targeted information. 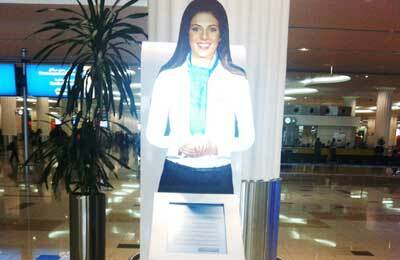 The new technology is a world first for Dubai International and an upgrade to the virtual assistants already in place. The new version ‘virtual assistants’ are programmed to answer frequently asked questions such as the location of departure gates, washrooms and check-in areas, rather than just providing a static message. The ‘virtual assistants’ were first introduced in December last year to communicate important travel information to the 50 million plus passengers that pass through the airport each year. They cheerfully greet and engage with passengers in order to provide them with information on the preparations they need to make prior to entering the security screening and immigration areas. The state-of-the-art assistants, which use the very latest in rear-projected audio visual technology to create the illusion of a real person, will now be able to provide a greater variety of information and will be deployed across the airport.